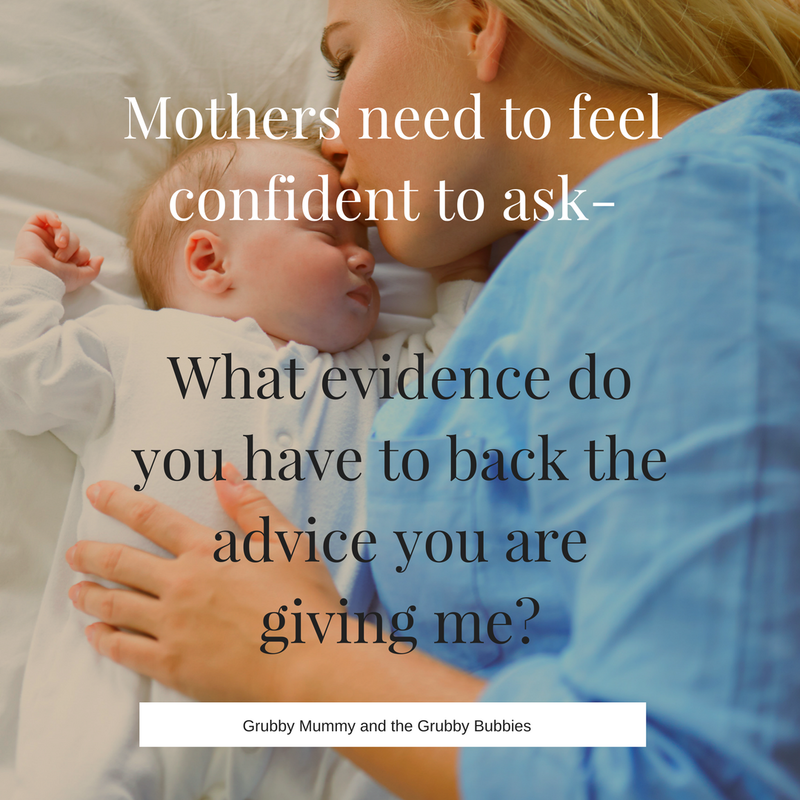 The question all mothers should not be afraid to ask- Can you provide the evidence to back your advice? As a new mother, you will be faced with a great many challenges as you find your feet and one of the biggest hurdles is working out who you can trust to give you advice. Not just small scale advice, like knowing if your baby needs socks on or how often to trim their fingernails, but large scale advice that can impact not only on your mothering experience but also on the way you and your baby experience each other. Advice on breastfeeding, sleep and settling, weight gain, health and development – the big ticket items, who can you trust to offer their advice? Who actually has the evidence to back what they are saying? Who is up to date and who is just feeding the same tired advice of years before? Has this person ever actually trained in this specific area they are advising on? I know who I trusted- my Midwives, my GP and my Child Health Nurses. If I knew back at the beginning what I know now, I wouldn’t have so wholeheartedly accepted the wisdom of these trusted advisors… no, I would have questioned them far more heavily and discovered that more often than I wish I had to admit, they were giving me incorrect, inaccurate, incomplete or simply out of date advice. They gave it sincerely, with, I have no doubt, the very best of intentions but, the ramifications for my baby and I were significant. This isn’t me, discrediting these wonderful folk who have dedicated their working lives to mothers as they establish their young families, absolutely not! I have also received some of the most life enhancing, life changing and valuable advice from these very same people. Their value is not diminished BUT this does not mean their advice should not be held to account or that it is above scrutiny and questioning. New mothers need to know that it is okay to question any advice they are given and should be able to expect that the person giving it, has the evidence to back them. IF the person is unable to provide the evidence and sufficient explanation for their advice, then it would be most suitable for that mother to ask to be referred to someone who is more specialised in the area in question. For example, breastfeeding advice would always be best coming from a trained International Board Certified Lactation Consultant over the breastfeeding advice of a GP who may have no training in lactation other than a few hours back at University. IF the person giving the advice, is in fact the ‘specialist’ then, they need examine their practice if they are unable to back what they do with up to date evidence. That I needed to adopt a Feed-Play-Sleep routine. This was given to me in an extremely matter of fact manner on numerous occasions over the course of my baby’s first 12 months. I felt as though the air was knocked out of me. When she left, I said to my husband, ‘but he’ll just cry and cry! There’s no way he’ll fall asleep! He gets so distressed when we put him down any time, let alone when he was tired!’ My husband agreed. We kept up soothing and I kept nursing my baby to sleep. But then his 6 week check came around … a different Child Health Nurse saw us. I reported honestly when asked about his sleep and settling and once again, I was told I was creating ‘unhealthy associations’ for sleep and to get a Feed-Play-Sleep routine happening as soon as possible. I told the nurse that while this may seem simple, my baby did not agree and that he was terribly distressed any time we withheld nursing or tried to place him down for sleep. She explained that I had established this routine and that he’d naturally be distressed by the change but change was necessary. I tried on many more occasions that failed dismally each time. It was at four months, yet another Child Health Nurse saw me and after I detailed in tears the mess that was our sleep and settling and all the things I had tried and ‘failed’ at, she informed me that my baby was ‘chronically sleep deprived and it would be affecting his brain development.’ She shared the details of the Public Mother/ Baby unit (sleep school) in our capital city as well as the details of a private facility as she’d heard the wait for the public unit was quite lengthy. I then had an appointment with my GP to sort out the required referral to sleep school and she also reiterated that our sleep issues came down to me continuing to have to nurse my baby to sleep. I have detailed the experience and learnings that came of my time at sleep school in articles before so I won’t rehash but I need to add that we were given a slide show of the process we would be following there and low and behold … we needed to put our babies onto a Feed-Play-Sleep routine in order to undo this association of nursing to sleep. The paediatrician we saw reiterated that nursing to sleep at the grand old age of 4.5 months was ‘unhelpful’ and possibly the cause of his ‘disrupted’ sleep patterns. Even under the guidance of sleep school, Feed- Play-Sleep was a disaster. I can honestly say, I used all of my willpower to not punch the nurse who saw us for the 6 month health check. I was at the height of PND and at my lowest ebb when it came to all things sleep and still she had the hide to imply I needed to ‘get that child into routine’. At my 12 month appointment, I was in a much better place and though my child still woke frequently and needed to be nursed to sleep, I knew enough to know we were okay. I flat out lied to the Nurse when she asked about sleep. At 18 months, I was feeling much stronger mentally and decided I would speak up. When asked about Sleep, I explained in a brief, but frank manner what we’d been through and just how unhelpful the advice I’d received each and every time I went to them had been. She seemed to listen. She wrote notes. I flushed red and walked right out. All the come backs, all the things that needed to be said … they came to me later. In that moment, I had nothing. So, this approach that is beholden as the ‘go to’ for establishing healthy sleep in your baby, it’s evidence based right? ‘Feed–play–sleep cycles are thought to bring sleep under the regulation of other learned stimulus cues such as bedtime routines, which are deemed to be more appropriate. However, we argue that post- prandial somnolence, a tendency to fall asleep after feeding, is not learned through operant conditioning. In fact, it is present at birth. Postprandial somnolence is an innate neurobehavior resulting from the effects of parasympathetic nervous system activation, elevated oxytocin, and elevated plasma cholecystokinin. The decoupling of innate neurobehavioral patterns may have unintended outcomes within the complex system for some mother–infant dyads, such as premature cessation of breast-feeding or frequent high levels of arousal of the sympathetic nervous system and the HPA system (Douglas & Hill, 2013). In the first weeks and months, this may result in a sensitized stress response. Further, we argue that from a behavioral perspective, the appropriate stimulus control of sleep is not an external stimulus at all. We contend that an appropriate stimulus cue for sleep is the internal state of sleepiness or felt sleep pressure. So basically, falling asleep after feeding is the biologically normal way for a baby to fall asleep and is present from birth, not something that is taught/ conditioned by a parent after. It is also plays a part in a baby’s the normal development of a their parasympathetic nervous system and a healthy breastfeeding relationship. By decoupling feeding from sleeping, there are concerns raised about potential unintended outcomes as well as the increase stress it places on the parent- infant relationship unnecessarily. With these findings in mind, it begs the question, why a technique that may actually cause the sleep problems it supposedly aims to solve and may jeopardise the mother and baby’s breastfeeding relationship, is so frequently and confidently dished out to new mothers? The fact that this advice is also coming from a trusted professional who actually specialises in maternal and child health makes the issue even more concerning. What evidence is being used to back current practice by frontline professionals working with mothers and their babies? How recent and up to date is their practice? Can and should we be doing better in terms of the more blanket approaches offered to parents when it comes to their baby’s wellbeing? I felt so extraordinarily letdown by the professionals I had placed my trust in and though I can see that at no point was the advice I was given, given with any view to cause myself or baby trauma, the fact remains, it did. Knowing that this very advice is not backed by evidence does little to help me feel I was an isolated case. I wish I had known I could ask for the evidence. I wish I’d asked if there was an alternative view. I will finish this though by telling you that my midwife was my shining light who saw me through this storm. She helped me find MY feet. She guided me without forcing her views, she allowed me to discover the mother I needed and wanted to be for my unique baby. There is so much good going on in the world of mother/ baby support and with continued discussion, questioning and awareness, I hope that the field will continue to flourish under the watchful care of those who care.